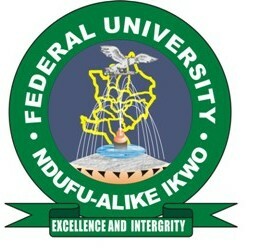 Federal University Ndufu-Alike, Ikwo (FUNAI) is selling forms for admission into its proficiency and professional programmes in French Language for the 2019/2020 academic session. Applications are invited from suitably qualified candidates for admission into the Alex Ekwueme Federal Univesity, Ndufu-Alike Ikwo (AE-FUNAI), Abakaliki, Ebonyi State, proficiency and professional programmes in French Language. DURATION: 8 Weeks FOR A1, 10 Weeks for A2, 6 WEEKS FOR PROFESSIONAL CERTIFICATE. COURSE FEE: N30,000 (A1, A2), N40,000 (PROFESSIONAL FRENCH- A2). ● Minimum age: 16 years. INTERESTED APPLICANTS ARE TO VISIT THE AEFUNAI FRENCH CENTRE (ZONE A) OR CONTACT THE PROGRAMME COORDINATOR FOR MORE DETAILS.